Hawaii Gov. David Ige speaks during a news conference about the state's mistaken missile alert, Jan. 30, 2018, in Honolulu. Hawaii's emergency management leader has resigned and a state employee who sent an alert falsely warning of an incoming ballistic missile has been fired, officials said. The Hawaii state employee responsible for launching an erroneous January 13 warning of an incoming missile attack has been fired, following a report stating that the employee had a history of confusing practice exercises with real-life events. The information was revealed Tuesday in a report by Investigating Officer Bruce Oliveira to the director of Hawaii's Emergency Management Agency. Vern Miyagi, the administrator for the agency, resigned Tuesday, as the findings became public. 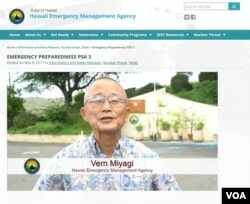 FILE - Vern Miyagi appears in a public service announcement about the addition of a nuclear warning to the monthly “Attention Alert” test in Hawaii. Miyagi resigned Jan. 30, 2018, as the state's emergency management administrator. The report said the employee responsible for the erroneous warning message did not realize an order for an emergency drill had been declared, and instead activated a real alert that went out to mobile phones and broadcast outlets across Hawaii. The Saturday morning incident led many Hawaii residents to believe for more than half an hour that they were under attack. The message said a missile attack was imminent, advised residents to seek shelter immediately, and emphasized, "This is not a drill." While many Hawaiians called loved ones and sought shelter — some opened manholes to take cover underground — it took 38 minutes before staffers at the emergency management agency got word out via cellphones that the warning was a mistake. During that time, the report said, the employee who made the initial warning, identified only as "Employee 1," was ordered to issue a cancellation. Instead, according to the report, Employee1 "just sat there and didn't respond." The report said that while the other five employees were aware of and trying to correct the problem, Employee 1 "was sitting and seemed confused." Finally, another staffer "took control of Employee 1's [computer] mouse and sent the cancel message," the report said, adding, "At no point did Employee 1 assist in the process." Further investigation revealed testimony by other staff members that Employee 1 had failed to hear a message on the loudspeaker that all other staffers testified they heard, alerting them to the fact that they were being instructed to conduct a drill and not issue a real alert. 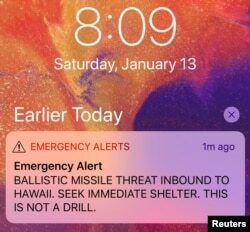 FILE - A screen capture from a Twitter account shows a missile warning for Hawaii, Jan. 13, 2018, in this picture obtained from social media. The staff members said the employee in question had confused real-life events and safety drills at least two other times, including incidents involving a fire and a tsunami. The report said the employee, who was a supervisor, had been "a source of concern for over 10 years." It also said other staff members have been undergoing mental health counseling to help them recover from the trauma of the event. In a news conference later Tuesday, Hawaii Governor David Ige told reporters he had not been aware of much of the information in the report until Monday, when he was told the employee had issued the alert on purpose because he believed the threat was real. The governor added that the state was working on improving its emergency management systems, starting with the appointment of an interim administrator to replace Miyagi. "I wanted to assure you that the men and women who work for the Hawaii Emergency Management Agency are committed to ensuring the health and well-being of the community, and they do that job well," Ige said. Tuesday's report noted that the warning system required too little differentiation between actual alerts and routine drills, something the governor said would be corrected.